Transfer Hatches are designed and constructed from a flexible format and offer a range of operations for the individual user to select their particular requirement from including floor and wall mounted types. 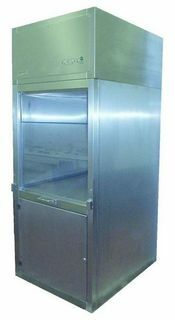 Manufactured from stainless steel, the standard hatch unit is fitted with either two air tight hinged doors that close against replaceable rubber seals or vertically sliding doors using bristle seals. The doors have polycarbonate fronts providing clear visual access from both sides of the hatch and are fully interlocked to prevent simultaneous opening. Additional features, such as air flushing and 2-way communications systems can be offered as extras if required. Installation options range from free standing to built-in. Standard overall dimensions are generally: 1680h x 820w x 780d to give an internal load area of 700h x 700w x 700d with a load height of 900mm from floor level. Other sizes made to suit customers’ requirements. 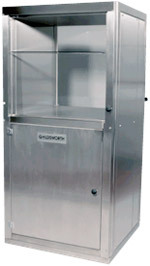 Standard hatch unit is fitted with 2 Polycarbonate doors in Stainless Steel frame with silicone extrusion fully interlocked to prevent simultaneous opening. The doors have clear fronts giving visual access from both sides of the hatch and close against the replaceable rubber seals. Designed for transferring products between rooms whilst maintaining the integrity of sterile areas, the doors are electrically interlocked to prevent simultaneous opening. 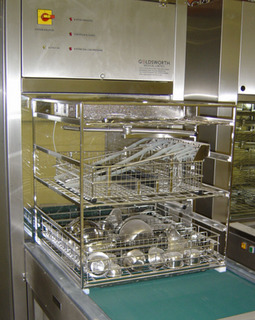 Typical applications include the return of washing machine baskets for which optional trolley docking mechanisms can be supplied compatible with the loading trolleys of the relevant make and model of washing machine. maintaining the integrity of sterile areas. The doors are electrically interlocked to prevent simultaneous opening and are automatically activated by placing carriers on the feeding conveyor or manually operated by pushbuttons.